CDBG-Community Development Block Grant for the Jackson Street Area. It is my pleasure to announce that Major Chris Smith will hold the position of Covington Interim Police Cheif effective immediately. Major Smith has been employed as a City Police Officer for the past 15 years and has served in numerous capacities. As Major, he served as Acting Cheif in the Chief's absence and assisted with budgeting and personnel matters and wrote administred Police Grant Programs. Chief Smith said, "I look forward to having an opportunity to continue on the path that the former Cheif Morgan has initiated and hope to help the officers continue to make a positive impact in our community." Chief Smith has been a resident of Covington for 15 years and resides in the City with his wife Emily and three daughters. He served as military police in the USAF for four years. The ability of a police department to efficiently and effectively handle the enormous amount of data and paperwork generated by its officers and activities is paramount to its success. Law enforcement agencies have a special obligation to ensure that it's administrative duties are handled correctly. Law enforcement documentation and reports are routinely subpoenaed into court and can mean the success or failure of prosecution of criminal and civil cases. Margie Wickline is the Administrative Assistant for the Police Department. Margie is a critical component to the departments day to day operations. Margie processes all paperwork concerning personnel matters within the department along with all reports generated by the department's officers including incident reports, accident reports, arrest data, and traffic summons. Margie is also the Records Officer for the Division of Police. A records officer serves as a liaison for the Library of Virginia for the purposes of implementing and overseeing a records management program and coordinating legal disposition, including the destruction of obsolete records. Reports such as accident reports or incident reports required by citizens should be requested through the police administrative office at 540-965-6331. Some reports and information are confidential and may only be released upon submission of a subpoena by the court, therefore ensure that you check with the administrative assistant to determine the requirements for obtaining information or reports from the department. Appointments with the Chief of Police should also be scheduled through the office of the Administrative Assistant. The Covington Police Department moved the police department to the newly constructed City Hall in October of 2000. The Police Department has a Major, Lieutenant of Operations, Lieutenant of Administration, Detective, Sergeants and Patrol Officers. 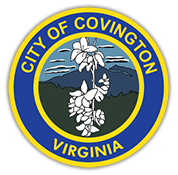 Covington, a city of 6 square miles located in southwest Virginia off Exits 14/16 on Interstate 64 is proud to be the county seat of Alleghany County. Named in honor of General Leonard Covington, hero of the war of 1812 and friend of James Madison and Thomas Jefferson, the City has a rich history and heritage and today forms the principal center of population in the region. © 2019 City of Covington | Website design by Covdesigns.com.